Offering independent living and enhanced living options, we provide a variety of senior services designed for each individual’s unique needs and desires. We know it’s the little things in life that make each day special, which is why we encourage our residents to foster new friendships and lasting memories every day. No matter what you need, even just a hug or a smile, we’re here for you. The heart of our calendar of activities, there’s always something to do in the Market Street Room. Stop by any day for a fun-filled community activity. Watch the choir practice on Mondays, take part in a monthly cooking course or enjoy a cocktail during Happy Hour in our community gathering room. Relax in our comfy chairs and come say “Hello” to the finches and canaries who call our in-house aviary home. Beautiful skylights and cathedral ceilings enhance this library and crafting room. Stop by on Tuesdays to create crochet caps for children with cancer. Enjoy any and all of your favorite indoor activities in this multi-purpose game room. Men are welcome to stop by once a month for Boys, Billiards and Brewskies. Resident craftsmen and tool experts appreciate this as a convenient place to create projects like wood burning, hand carving and more. Active residents love our Nustep Machine that takes the ease off your knees for some therapeutic exercises. Host to garden parties and summer concerts, relax and enjoy nature in this tranquil, green space. It’s not about the food here, it’s about the memories created around a table of friends and family. Our Executive Chef continuously create unique, locally-sourced meal options for all dietary needs to inspire warm conversations. We’re always looking for new additions to the menu, so feel free to share your family favorites! We love to learn about our residents’ favorite activities and pastimes. Through the Life Enrichment Program, we’ll develop community events that involve the hobbies and interests shared among friends. Our staff incorporates them into our daily events calendar! We love to hear what you’re interested in and what excursions you’d like to try. Independence Village Of Oxford (Waterstone)? 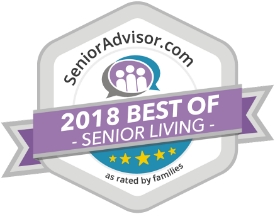 Independence Village of Oxford in Waterstone is proud to announce that they have been named the Best Senior Living community by the Oxford Leader. Deciding which senior living community is best can be overwhelming at first, especially because of the weight the decision will have on you and your family. Luckily, there are many resources to help you in your search. We have apartments available today! We’d love to show you around our gorgeous community. Schedule a tour today to learn more about our various senior living options.